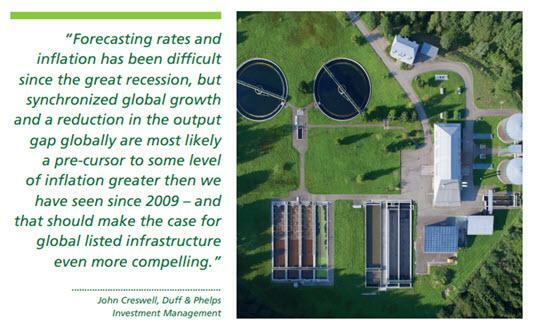 The macro landscape is forming a firm foundation under the infrastructure asset class, with demand powered on by a range of unforeseen geo-political circumstances. It should be no surprise that we are now finally seeing global interest rates rise. The USA had already increased rates three times in 2017 and Jerome Powell (newly installed Fed Chairman and replacement to Janet Yellen’s ‘safe pair of hands’) made the third rate rise (0.25%) of 2017 in December. Interestingly, Powell has been a supporter of Yellen’s gradual interest rate hikes, and he shares her concerns about weak US inflation – so a degree of continuity is likely to prevail for the foreseeable future. Mark Carney in the UK has recently reversed the post Brexit base-rate cut and moved the benchmark base-rate back up to 0.50%, representing the first upward move in UK rates in a decade. And in the Eurozone, Mario Draghi has eventually conceded that he will taper QE in 2018, paving the way for progress in the EU and, hopefully, positive rates. So are these rate increases premature? There is no denying that the USA has experienced some convincing growth in the last 12 months, and while Donald Trump’s massive infrastructure spend looks to be pushed further and further into the distance, the US economy is doing unusually well…for now.